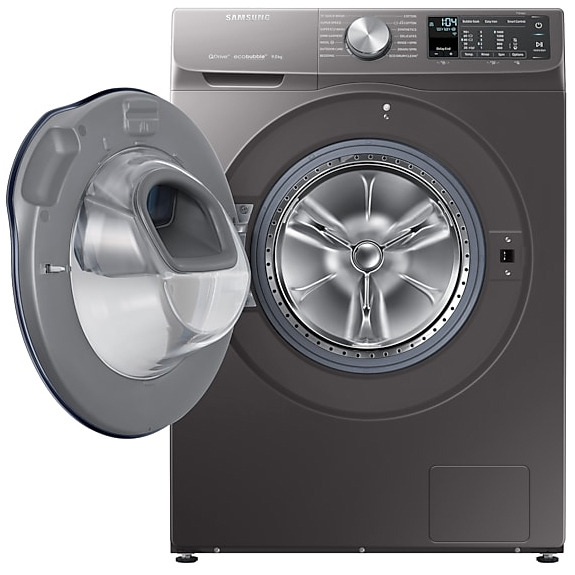 The WW90M645OPO/EU freestanding washing machine from Samsung looks great in grey graphite, and has a 1400rpm spin speed and a 9kg drum capacity, giving you plenty of space for your weekly laundry. 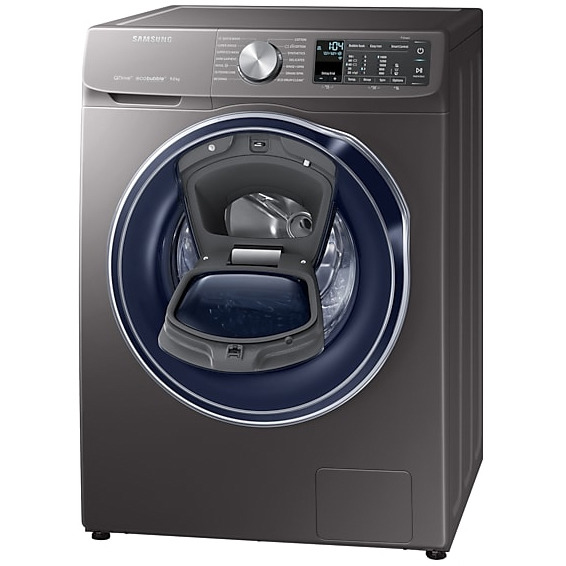 It’s also packed with great features and the latest technology to make getting fresh, clean clothes as easy as possible. This technology reduces the washing time by up to 50% without compromising the cleaning performance. Samsung’s unique fabric care drum is equipped with a pulsator that creates a fast water flow that covers the entire drum. As a result, the detergent penetrates deep into the fabric, to give your clothes a thorough wash in much less time. Ecobubble technology mixes air, water and detergent to create bubbles that penetrate your clothes faster, helping you wash at cooler temperatures. This saves energy and money. AddWash means you can open the door to quickly drop in anything extra during the wash. The innovative diamond embossed drum design prevents clothes from snagging, while a cushioning layer of water adds an extra level of care to your laundry. As a smart appliance, you can use your smartphone for remote control of this machine. You can check and monitor your laundry cycles from the sofa, the office, or even when out and about. Available on Android and iOS. Whether it's cotton, synthetics or baby clothes, add a 30 minute bubble soak to any of your preferred programs at the touch of a button. Then let the ecobubbles penetrate deep into the fabrics to loosen tough stains – giving you a thorough and efficient clean after every soak. The quiet Digital Inverter Motor gives you long-lasting, reliable performance, with less noise, less vibration and less wear and tear. Connect to the service centre for technical support using your mobile device. 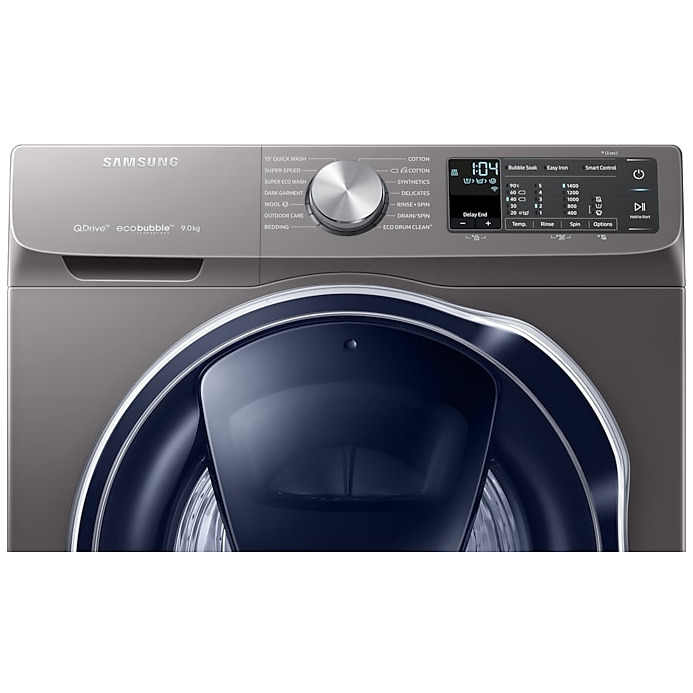 This enables the washing machine to run a self-diagnostic test, which is sent to the service centre’s experts to identify issues and provide a remote troubleshooting service.